Late last year, I combed through the Montclare SaaS 250 — a directory of the biggest SaaS companies in the world — to find common trends in what I thought would be a significant dataset. 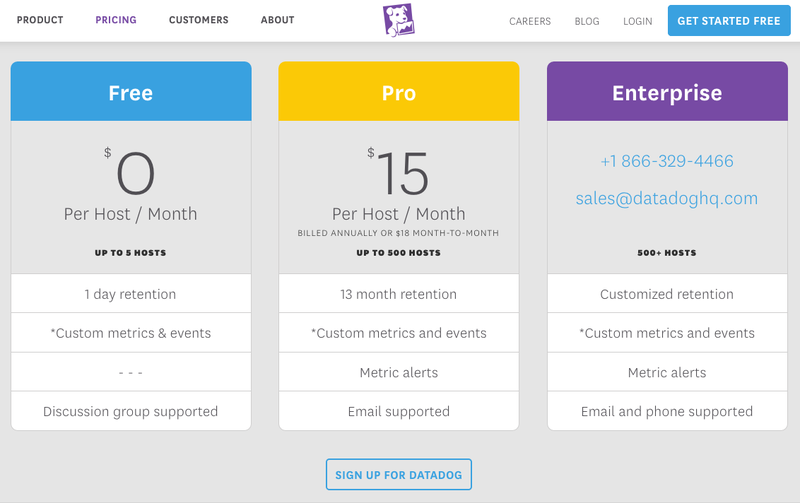 As it turned out, 80% of the 250 biggest SaaS companies didn’t have a pricing page at all. Expecting to find a set of data more representative of what I’m used to seeing around (essentially startups), I turned to a bigger sample, scraping information from the first 400 startups in AngelList’s ‘Trending’ category. Of the remaining 386 which hadn’t shut down, I found that startups are around twice as likely to show their pricing than their enterprise SaaS big brothers. 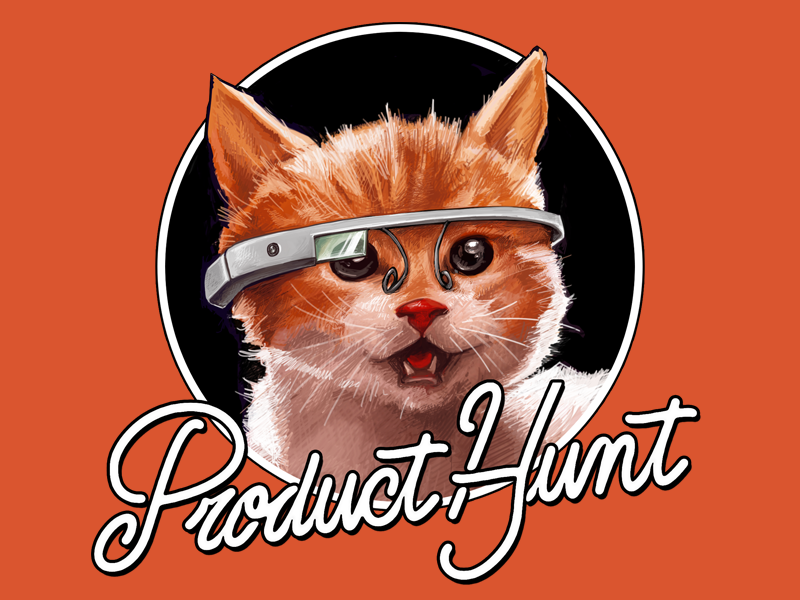 In fact, 39% of the 389 startups I analysed had pricing clearly available. As I looked at in that previous article, there’s often good reason behind hidden pricing, and, for the top 250 SaaS firms, that reasoning was mostly that they are selling to enterprise customers who thinking pricing is just a formality. And, besides, enterprise SaaS is a more complex beast than self-service, or SaaS aimed at SMBs. So, equipped with wider range of data to analyse, I set about to answer the question: How do the top 386 trending AngelList SaaS startups compare to the Montclare SaaS 250? In both the Montclare 250 and AngelList Trending data sets, the results are exactly the same: most SaaS companies offer between 3 and 4 packages. In a recent article from Price Intelligently’s Patrick Campbell, he says that over-complicating and over-simplifying pricing is an equally terrible mistake. This is because complicated pricing can give buyers analysis paralysis, yet simple sliding scale structure built on a single value metric can stunt the company’s growth and kill any opportunities for upsells. Additionally, research shows that 7 ± 2 is the maximum amount of objects an average human can hold in working memory. Because of this, it makes sense to limit your price points to just 3 or 4 significant choices -- unless the buyer makes a choice right then and there, they could easily forget some key details later on down the line. This said, package count on the extreme end of the scale (Twitmusic’s 9 packages, for example), is often linked to a single value metric like number of Twitter followers, not a complex array of features. Highlighting a package as popular or best value or simply putting it in a different color to the others is a technique SaaS companies can use to make the buyer’s decision easier, promote their most profitable package, or even to draw attention first to a higher priced package to make the others look cheap (more on that later). However, just over half of the 386 analyzed startups chose to use this tactic. Why is that? On Episode 271 of Startups For The Rest Of Us, where the hosts talk through my original 250 pricing pages analysis, Mike Taber has an answer for that. He says it could be because by listing 3 packages (the mode of packages offered), the price is naturally anchored in a low/medium/high setting, and there’s no need to highlight anything and sway the potential buyer away from a potentially more profitable plan. 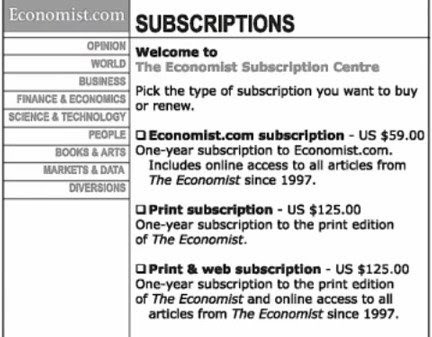 One of the most striking things about looking at pricing pages in a vacuum (as in, without sometimes even knowing what the company does), is how disconnected from the rest of the site the page tends to be. While the landing page is often very benefit and social proof driven, it’s rare that the pricing page will list anything other than the features. Surely it wouldn’t hurt to reiterate the reason the potential buyer is here in the first place. And, not to mention the fact that a common search query for SaaS companies is [company name] + [pricing]. 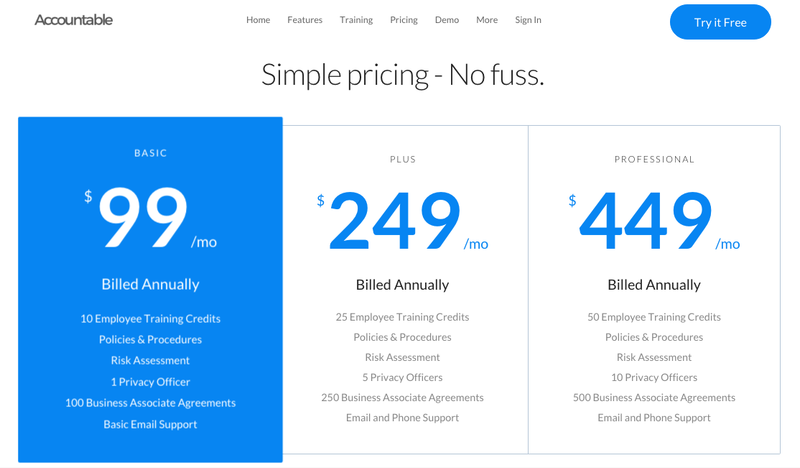 Reiterating the benefits or employing any kind of copywriting tactics at all on the pricing page seems like an obvious, often-overlooked choice. Heatmaps show that visitors spend twice as much time looking at the left side of the page as they do the right. The principle of least surprise: a UX axiom which says that the last thing a user wants to happen is for them to be confused. Since we’re used to reading left to right, and seeing a low-to-high structure, sticking to it can ease user discomfort. In Robert Cialdini’s book Influence, he recounts an eternally relevant A/B test from the retail world staged in 1975. In the experiment, salespeople offered potential buyers of billiard tables two choices: a $329 model and a $3,000 model. The usual tactics are to offer the lower priced model in hope that the customer isn’t scared away by hearing big numbers, but one week, instead of starting with the low-priced table and try to sell up, the salespeople changed their tactics to offer the $3,000 model first. What happened? An 81% increase in revenue from billiard tables. The idea that it’s easier to “sell down” than it is to “sell up” (meaning that it’s a more effective strategy to start high and the reduce), is a strategy employed by only 9% of the analyzed SaaS companies and is a tactic that comes with high recommendations from SaaS pricing expert Lincoln Murphy. Going back to the previous point about low-high pricing, however, the tactic of offering something first which seems inadequate could be equally as powerful. By far the most common 4+ package layout is 3 priced packages and an enterprise package with the CTA of ‘Contact Us’. For the minority of SaaS companies which show their pricing, the complexity of enterprise deals forces more than half of SaaS firms to leave their enterprise package pricing undisclosed. Enterprise customers don’t care about the price anyway, just about the solution. Like how fancy restaurants don’t have pricing, hidden prices are an aesthetic that gives the aura of exclusivity. Enterprises are used to having to call for pricing, so the Principle of Least Surprise returns here again. You don’t want your CTA to be subtle. 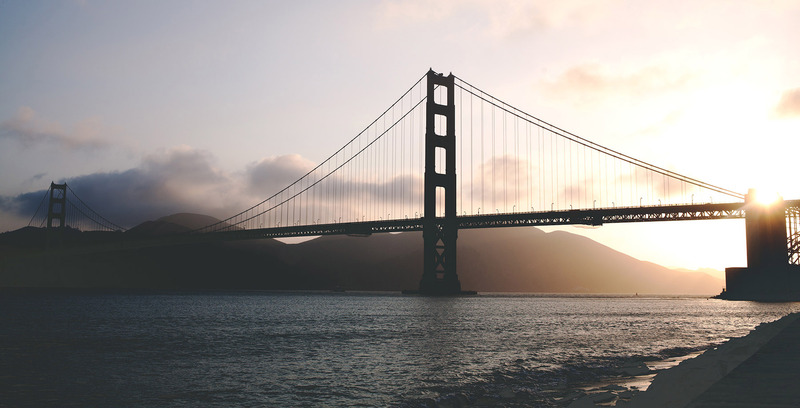 After all, it’s the only place you want visitors to click when they’re on your pricing page. According to Unbounce, a rule of thumb for CTA color is to “look for the dominant hue of your page and pick its contrasting color for your call to action”. There’s evidence to support this from the famous red/green A/B test carried out by Performable, which showed a 21% higher CTR on the red button which contrasted with the otherwise green page. 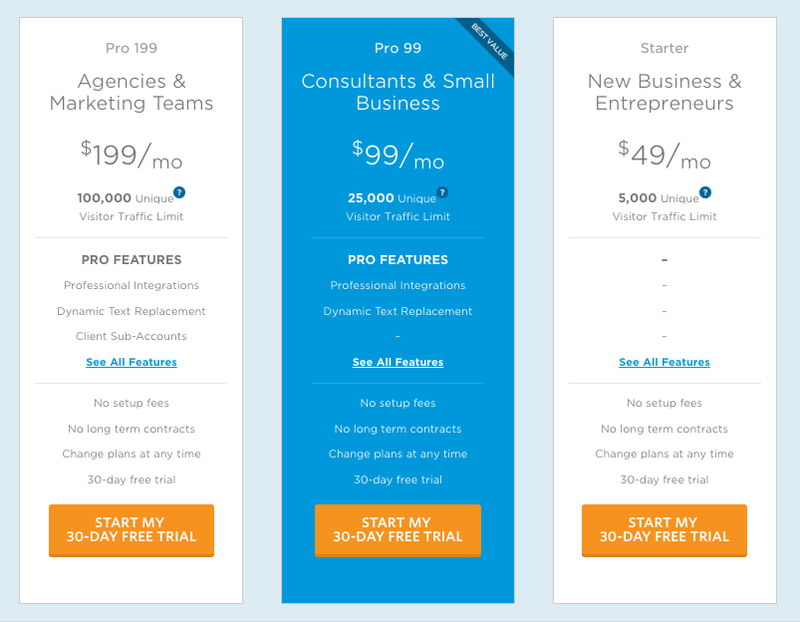 As you can see, the orange CTA sticks out because it's the top-of-the-funnel package they expect to get leads from. While the Premium package is highlighted, the efforts in the copy above the buttons are focused on getting visitors to test the free package. Unlike the SaaS 250 where the most common CTA copy was ‘Buy Now’, AngelList trending startups made references to ‘buy’ in their CTA copy less than 2% of the time. As you’ll see, unlike the enterprise-focused SaaS 250, startups seem to be pushing self-service free trials instead of demos with sales staff. Another couple of data points about CTA copy: conforming to the true definition of a CTA, 95% of samples start with an imperative, like ‘try’, ‘start’ or ‘get’. 39% of samples are in title case, with the first letter of each word capitalized, while 38% are written in all caps. While writing in all caps is frowned on (even amongst conversion-hungry copywriters), pricing pages are essentially a call-to-action in themselves, so drawing attention to where the visitor should go next is essential. 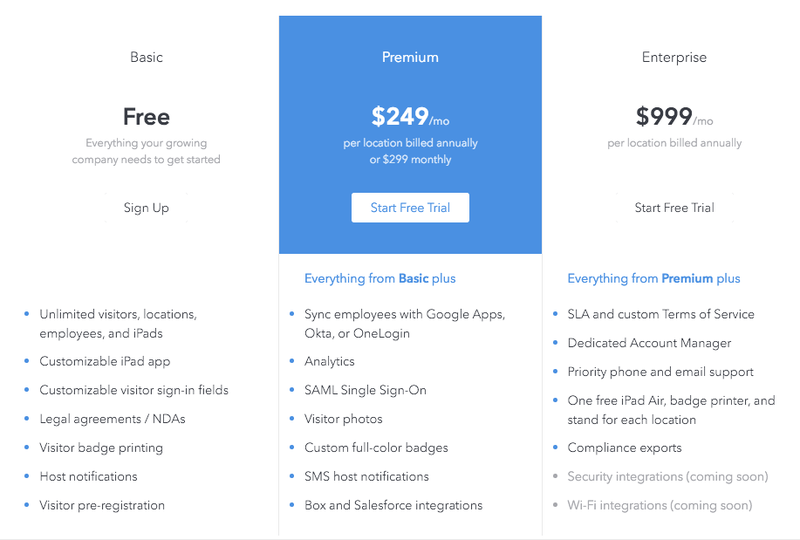 63% of both Montclare’s SaaS 250 and the 383 AngelList trending startups offer a free trial on their pricing pages, many as the only option to ease into the product. When looking at the psychology of free stuff and risk reduction, it’s obvious why SaaS companies use this powerful tool as a way to get customers. And, as I’ll look at later, a probable reason behind why only 6% of the sample companies offer a money back guarantee. In fact, to reduce friction, OnFleet’s pricing page shows both the formula and the slider, as well as anchors the price by showing tasks reducing in price tenfold with just a comparatively small increase in monthly task allowance. For comparison, almost 3 times as many AngelList trending startups offer pricing on a sliding scale than the Montclare 250. While some SaaS companies choose to name their packages in relation to their price (with names like ‘Basic’, ‘Premium’, etc. ), some grab the opportunity to target segments of their visitors and name the packages by who they’re for. Free packages are sometimes named ‘Hacker’, like in the case of Algolia. Enterprise packages are almost ALWAYS called Enterprise. Since most SaaS startups offer customers a free trial, there’s not much need for a money-back guarantee which explains why so few companies list it. That’s right, only 30% of the 386 AngelList trending startups analyzed operate on a freemium model, with the vast majority of the rest relying on free trials. That said, that means that at 93% of the sample pages have some kind of free element, whether it’s a free package or a free trial. According to Weekly Growth, early stage SaaS startups are best off with a freemium model because it is more likely to attract early adopters. Later on, however, with a larger customer base, the huge amount of free-only users can put a massive strain on your support staff, and may end up negatively impacting your business overall. 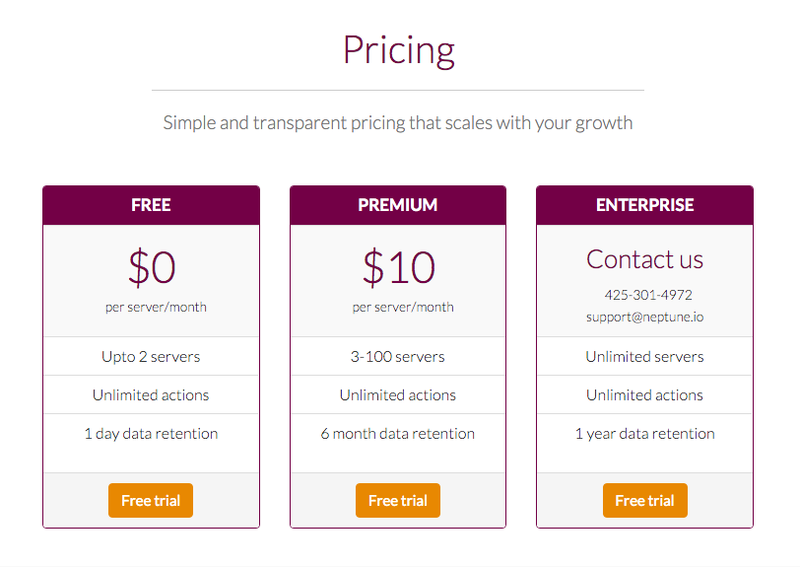 What are the differences, then, between enterprise and startup SaaS pricing pages? The most striking difference is that a SaaS startup is almost twice as likely to show its pricing than an enterprise SaaS company. For enterprise SaaS serving a larger amount of influential customers, it's probable that a lot of business comes from referrals and deals are done over the phone without a pricing page being necessary. 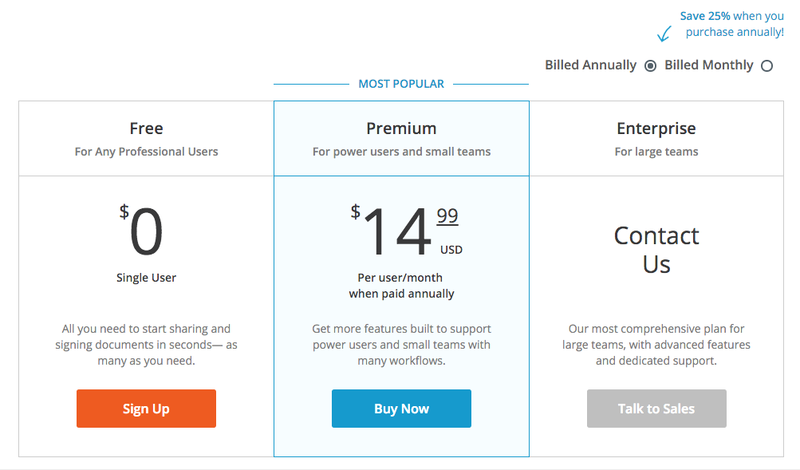 This would explain why 80% of the SaaS 250 didn't have a pricing page. 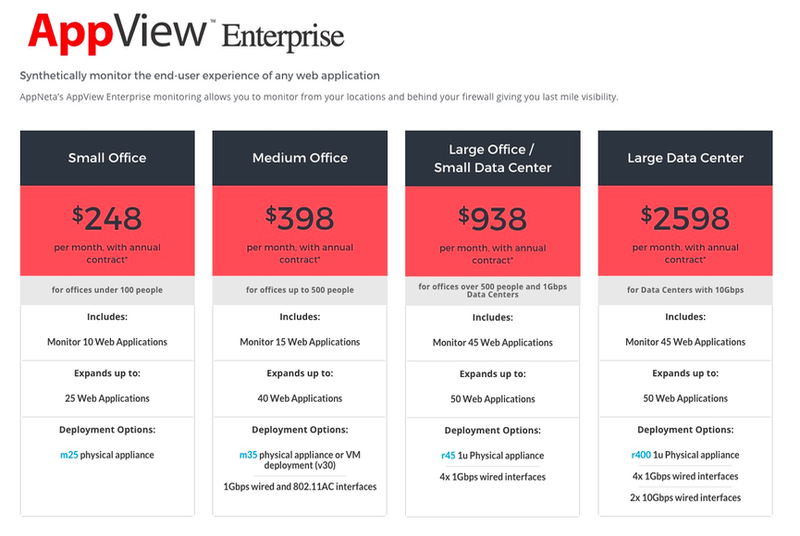 As well as this, a comparison between the two data sets shows that enterprise SaaS reiterates the benefits on their pricing page 25% more often. 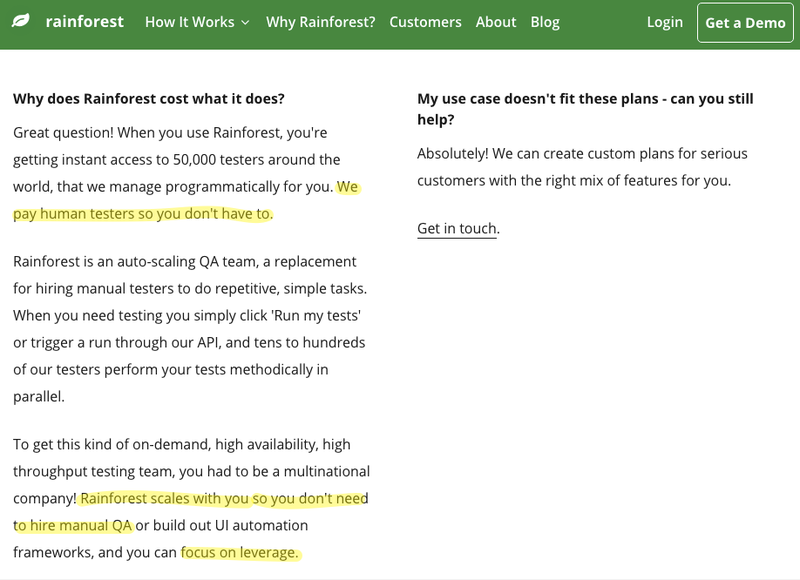 Just like we saw Rainforest's pricing page earlier, it could be that enterprise SaaS's high-ticket products need to be justified to buyers because choosing one provider over another is a huge investment. And finally, the last major difference is that startups are 19% more likely to have a mixture of priced and 'contact us' packages. Just because a SaaS company is a startup doesn't mean it can't serve enterprises and startups. 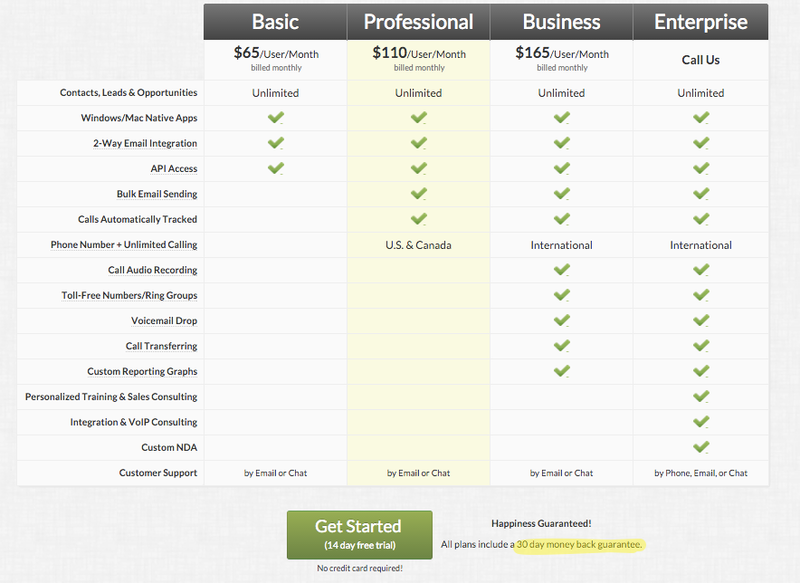 So, by having both transparent pricing for smaller companies and a 'contact us' package, they appeal to both markets. 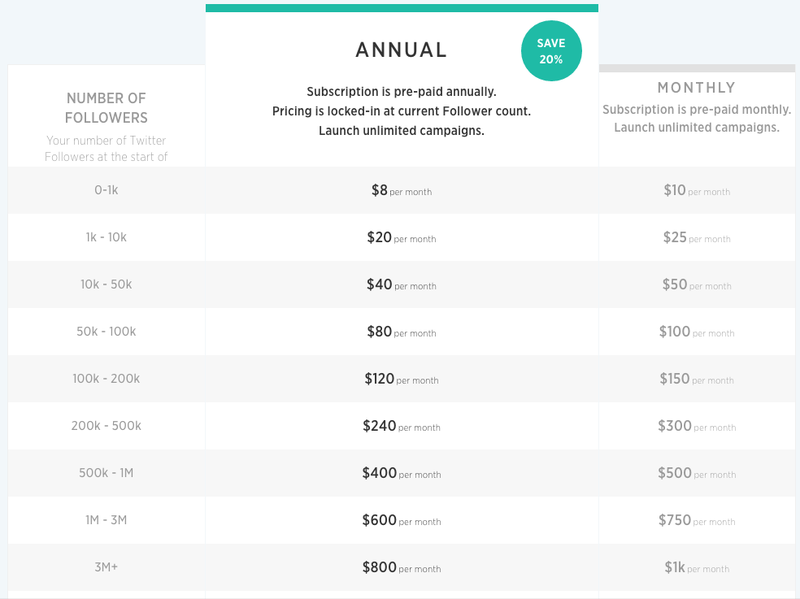 Well, it's been an eye-splitting three days spent inside spreadsheets and on pricing pages, so I hope you find this data interesting and it gives you an insight into the typical SaaS startup pricing pages. This was a guest post from Benjamin Brandall. Ben is a content creator at Process Street. Find him on Twitter here.